The development of the cottage industry is important for a number of reasons. Many of the weavers, seamstresses, embroiderers, and silversmiths previously worked on the streets, having no regular income or security for their families. The cottage industry provides them with both a sustainable skill and a regular source of income. Whilst some of the cottage industry workers come to the Tabitha headquarters to work, many of the women also work from home, allowing them to be at home with their children while still earning income. For many women and families cottage goods production is now a primary income-earning opportunity working their way out of poverty. Tabitha Cambodia pays workers a fair price for all products. Profits from retail mark-up support Tabitha’s overall administration and the long-term sustainability of its community development programs. Tabitha Singapore imports a variety of cottage industry silk products ranging from scarves and handbags, to soft furnishings for the home such as cushions and bedding. These products can also be specially ordered to meet your particular size and colour needs and an interior designer is available for consultation at home should you require assistance in making your purchase. Tabitha Singapore is the largest importer of Tabitha silk and other handmade products outside of Cambodia. These are sold at a number of events throughout the year, including community fairs, home sales, and school fairs or directly from our stockroom at UWCSEA Dover. If you are interested in learning more about how to host a home sale, please direct your inquiry to silksalesmanager@tabithasingapore.com . Sales events are manned by unpaid volunteers. Costs are incurred in bringing stock into Singapore and a negligible amount on marketing costs to promote certain events. All remaining funds are remitted to Tabitha Cambodia. Details to upcoming sales events can be found on our home page . If you are interested in buying Tabitha cottage industry products or in volunteering at sales events, please drop us a message under Ways To Help . ​For more information, please email us at silkliaison@tabithasingapore.com . ​​​TABITHA SILK - Where Does It Come From? 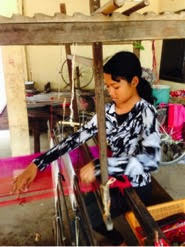 Every item of Tabitha Silk that you buy is handmade by our weavers and seamstresses in Cambodia. We have 209 weavers and seamstresses. 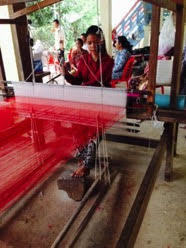 They are self-employed, buying the silk from us to work with in our small workshop in Phnom Penh or in their own homes. The weavers buy the raw silk from us and weave it into cloth on simple looms at home. Many of these women were forced to work as street women during the Pol Pot years under the Khmer Rouge. They have been through unimaginably hard times and lived in total poverty for many years. Now their lives have been transformed. Making Tabitha products gives them a regular income and keeps them self-sufficient. The focus of Tabitha is not to make a large profit, but to provide a steady living for the weavers and seamstresses. Over 90% of our proceeds go directly back to them. Training these determined ladies to weave and sew the silk would not have been possible without the help of women from the older generation who learn't these skills in their youth. Silk production was banned under the Khmer Rouge, but is now alive and well at Tabitha! The Tabitha seamstresses buy the finished cloth and transform it into jewellery, scarves, bags, homewares and toys. They can choose to work from home, where they can still look after their children, or work at Tabitha House, where our silk workshop is based. Once the products are finished, they sell them to us to sell to you. There is no large factory, or manufacturing line, just an incredible team of hardworking ladies providing for their families.